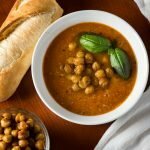 Crunchy chickpeas and savory tomatoes fuse together perfectly in this delicious (and totally vegan) chickpea tomato soup. Rinse and pat dry the chickpeas. Line a baking sheet with parchment paper, and spread out half the chickpeas in a single layer. Drizzle chickpeas with olive oil. Sprinkle with curry powder, salt, and pepper. Toss to coat. Roast chickpeas in the oven for 20-25 minutes, stirring occasionally, until crispy. Set aside. In a large pot, heat a drizzle of olive oil over medium heat. Add onions and garlic, and cook for 3-5 minutes, until softened. Add the tomatoes, vegetable broth, basil, cumin, oregano and agave syrup. Stir to combine. Bring to a simmer and cook for 15 minutes. Add the remaining chickpeas and cook for 5 minutes. Serve the soup topped with the crispy chickpeas!